From Big Ben to the Statue of Liberty to the Sydney Opera House, cities across the world are dotted with iconic architecture that has become synonymous with their city and Korea is no different. For Seoul, the must-visit attraction for international visitors is Namsan Seoul Tower, visible from nearly anywhere within the capital. Originally created as a broadcasting tower, the site has now become a beloved cultural space featuring a beautiful observatory and various experience facilities. The entire city of Seoul can be seen spread out in all directions from the observatory at the top of Namsan Seoul Tower. Visitors can also enjoy trying on hanbok and visiting various exhibitions within the complex. The many restaurants and cafés at the tower are great for dining with a view. The tower becomes even more romantic at night, when the city lights up. Namsan Seoul Tower is largely divided into N Seoul Tower, the actual tower, and Seoul Tower Plaza, the lower section with facilities and shops. Each level has various eateries and attractions to enjoy. 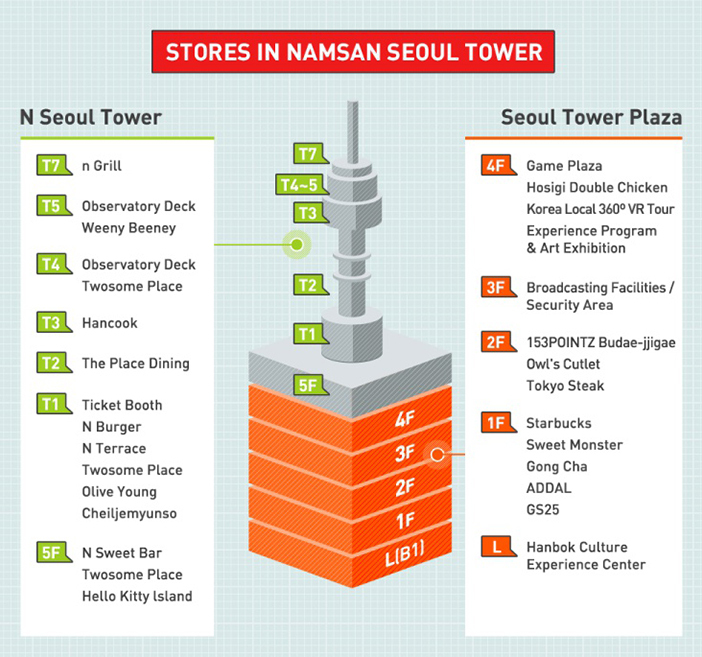 Before visiting, check out our guide to help plan your trip to Namsan Seoul Tower. 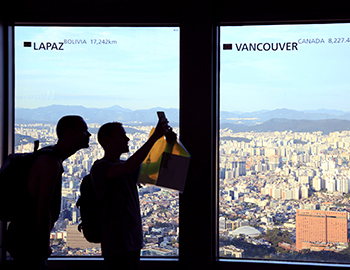 The observatory offers a 360-degree panoramic view of Seoul as well as information on Seoul and Namsan Mountain. To get to the observatory, buy a ticket from the ticket desk at the Plaza Square or on the basement level. Visitors to the Namsan Seoul Tower Hanbok Culture Experience Center can try on hanbok, the traditional clothing of Korea. Costumes include the clothing of kings, queens, and dignitaries, perfect for themed photographs. Families, couples, friends, and solo travelers can enjoy this experience of taking unique souvenir photos. Namsan Seoul Tower is decorated with media art displays created through the use of OLED panels. The theme of each artwork varies by floor, making each level unique and enjoyable. 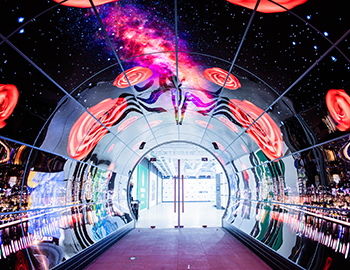 The first floor features both a tunnel display and a panorama display, while the second and fourth floors feature panels on the ceiling, showcasing videos at various degrees. Visit the home of beloved character Hello Kitty in this special exhibition. 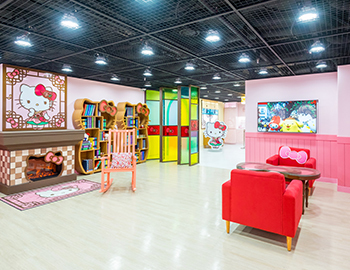 Hello Kitty Island features four rooms designed in the concept of Hello Kitty inviting friends to visit “Hello Kitty House” in Seoul. 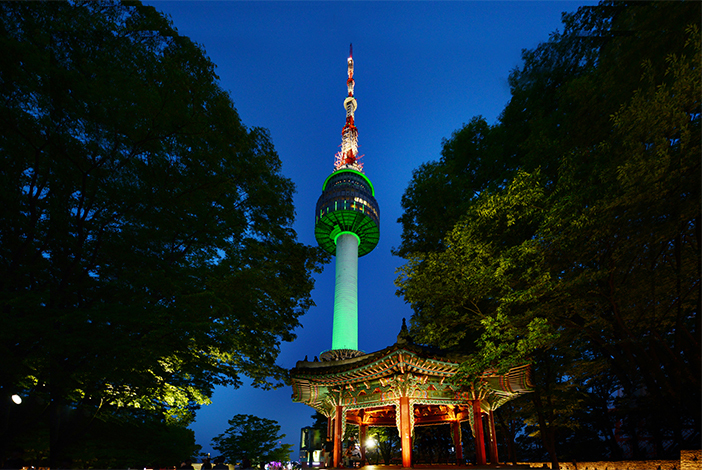 At Namsan Seoul Tower, you can travel to all the famous attractions of Korea for free! 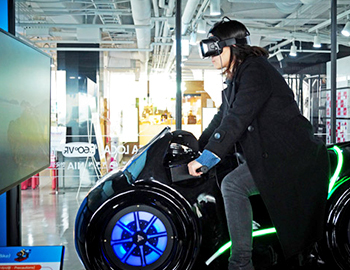 The 360° panoramic attractions can be experienced through eight different styles, via flying, driving a car, riding a motorcycle, horse or bicycle, controlling a drone, walking, or hiking. Pledge of Love is a space within Namsan Seoul Tower dedicated to capturing and sharing the memories of families, couples, and friends. Simply take a snapshot in the photo booth and then paste one of your photo stickers in a box on the Pledge of Love wall to be remembered and enjoyed by all who visit. The Roof Terrace is an expansive outdoor observatory of Namsan Seoul Tower designed for couples. Ever since the main characters of a TV program visited the terrace and attached two padlocks to the fence as a symbol of their love, tens of thousands of love locks can be found hanging around the terrace each day. At the gift shops in Namsan Seoul Tower, visitors can find padlocks alongside N Seoul Tower-themed products and the usual souvenir items found in most gift shops throughout Korea. 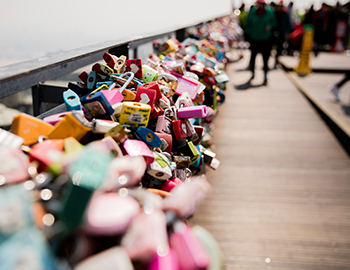 Locks can be attached to the fence outside as part of the well-known tradition of "love locks" started by a popular Korean drama. HanCook is a Korean-style buffet restaurant popular among family visitors. It offers a classic ambience and about 30 different dishes. The HanCook & Observatory package allows visitors to enjoy the combined benefit of touring the observatory as well as dinner at HanCook at a lower price. The revolving restaurant n Grill atop Namsan Seoul Tower is the ultimate date spot and is frequently used as a site for marriage proposals. Although the full-course meals and elegant interior are excellent in their own right, it is the restaurant's panoramic views of the city that are sure to impress. All tables are set facing the windows, assuring you with the "best seat in the house" no matter where you sit. 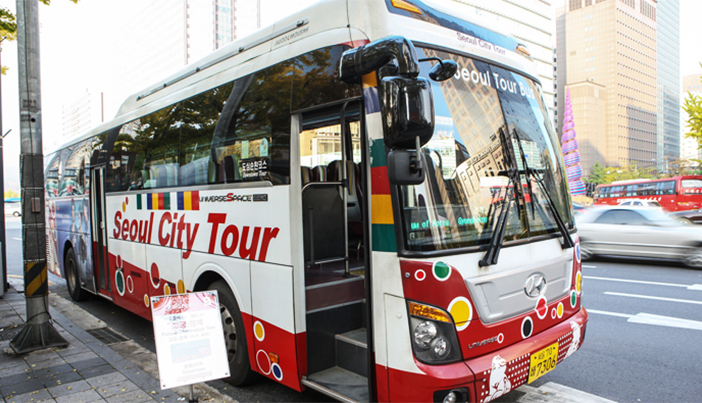 There are a variety of ways to get to Namsan Seoul Tower. Each method has its own pros and cons, so tourists can choose the option that best matches their schedule and tour budget. Access to Namsan Seoul Tower by passenger vehicle (cars and/or taxis) is restricted to reduce the environmental impact on Namsan Park. 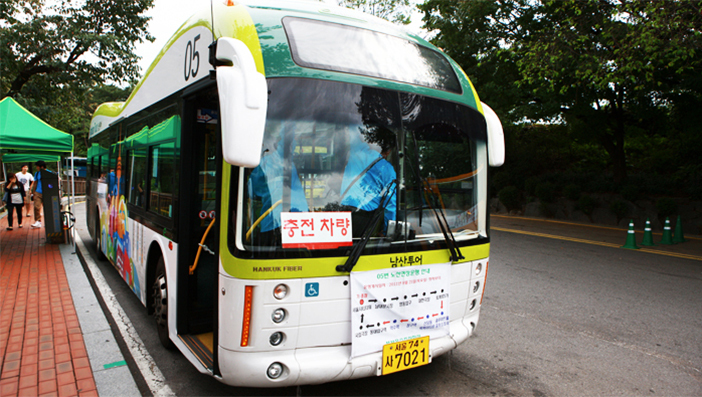 Therefore, visitors coming by car should consider parking at a lot near one of the Namsan shuttle bus stops. Directions: Myeong-dong Station (Seoul Subway Line 4), Exit 3. Take the road to the right of Pacific Hotel and walk for approx. 10 minutes. * Admission charged separately (Zges 14 and older 2,000 won / Ages 13 and younger 1,000 won). * Standard hanbok rental 3 hours; additional 5,000 won charged for each hour over.